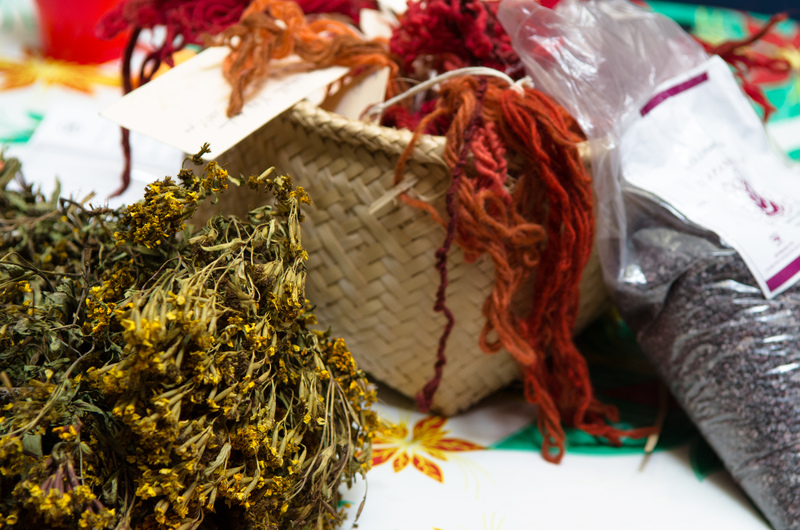 This entry was posted in Clothing Design, Cultural Commentary, Textiles, Tapestries & Weaving, Workshops and Retreats and tagged class, Cochineal, course, fustic, indigo, Mexico, natural dyes, Oaxaca, pericon, shibori, study, wild marigold, workshop. Bookmark the permalink. 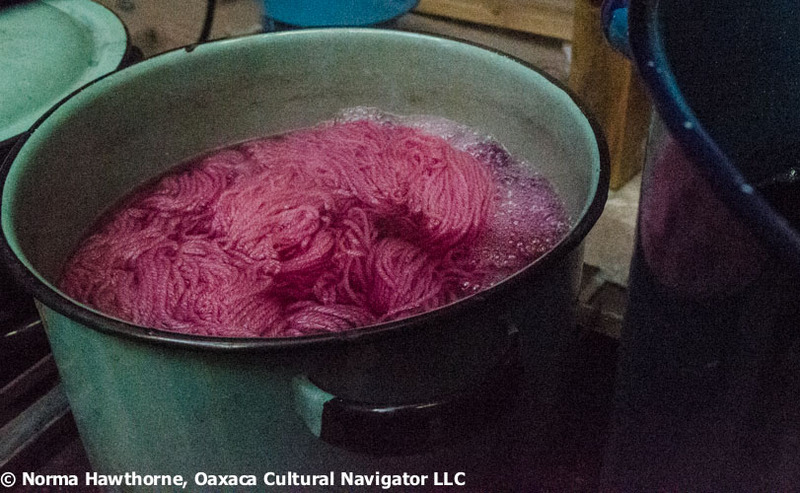 I am visiting Oaxaca City March 20-29 and would like to take your 1-day cochineal course. Is it possible? I am interested in your dye classes 2 or 3 days February 18-20th. I understand that you will learn various dye processes but what do you actually make during this class. Do you make the same thing by taking the 2 day versus the 3 day class – just less colors? 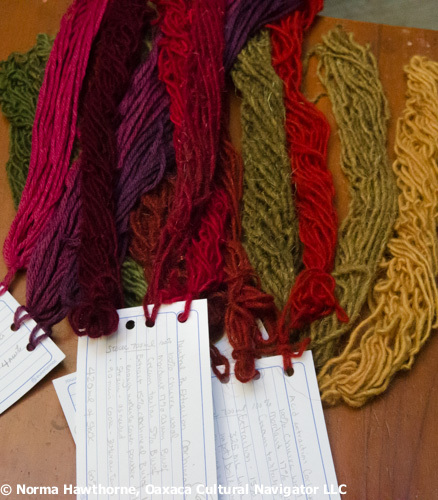 What you learn are dye recipes, mordanting and over-dyeing. 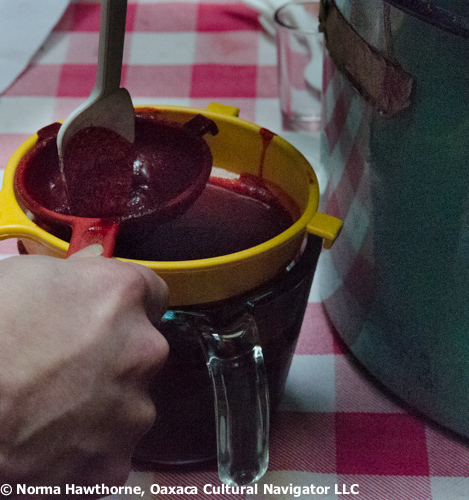 You make dye samples and a sample card, and have recipes to take with you. 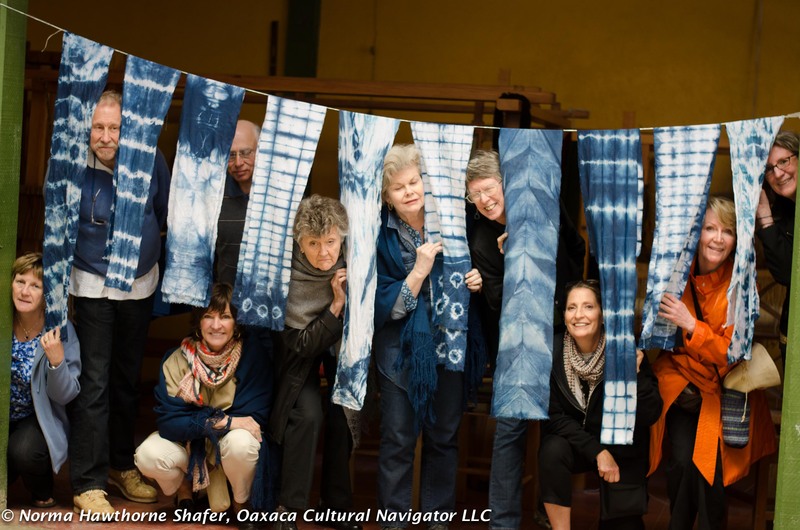 If you take the three-day workshop, on the day you dye indigo you make an indigo-dyed cotton scarf. I would like to take the 3 day workshop. I want to go to Carnaval March 5th..so either right before or after that day. Can you tell me what dates are available? 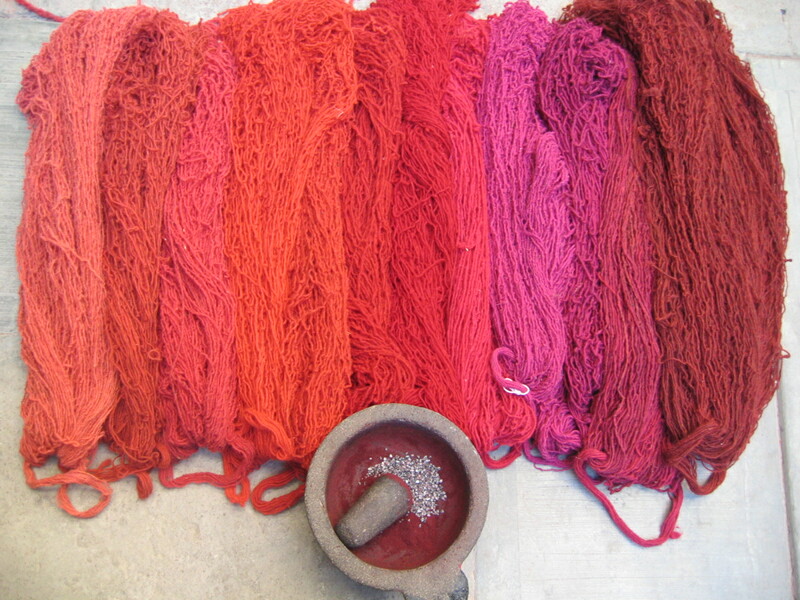 I am interested in using natural dyes with fabrics. Is it possible to dye samples of cotton or silk in the workshop, instead of working with wool? Hi, Im interested in the 3 Day workshops, and if there is a posibility to do a visit to a Indigo plantation would be fantastic. I would go any time in september, is the instructor in Spanish or english, I have no problem Im from Colombia. The indigo plantation is on the coast of Oaxaca, 12 hours by bus from the city. We do not offer visits there. I’m sorry, you would need to make your own arrangements. Hi. I don’t have an email list for dye workshops. When you want to take one, contact me and we will schedule it. Thank you. I am interested in booking a 2 day workshop sometime between Feb 4th and 10th. Is there instructor availability for any of those dates? Looks like a wonderful program! 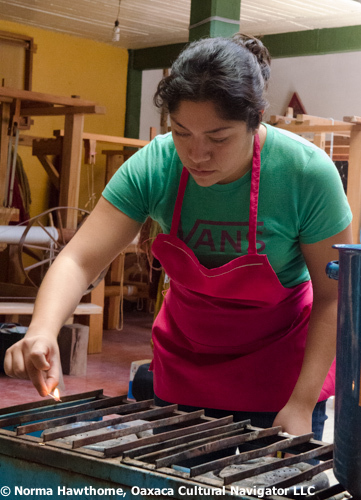 I’m considering a trip to Oaxaca and would love to do a 1 or 2 day workshop while I’m there on the natural dyes. My travel dates i’m considering are April 3rd and 4th 2017. Would I be able to do a workshop around then? I think I will be able to come between March 5th-30th. I would like to book a workshop in the beginning of my travels! Can you let me know some dates that work for you? And if you can send me any more information on the dyeing workshops that would be great. Can you send me an address to where I will be taking classes as well? I am the co-owner of a local natural dye company based out of Baltimore. 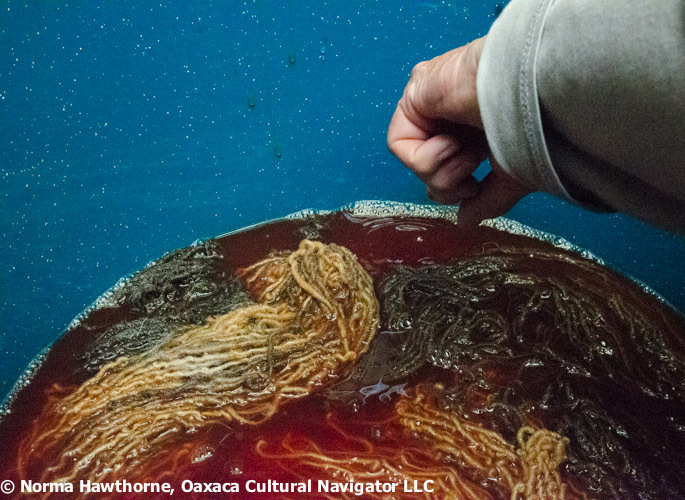 One of my 2017 goals is to dive deeper into natural dyes rooted in rich histories of other cultures. 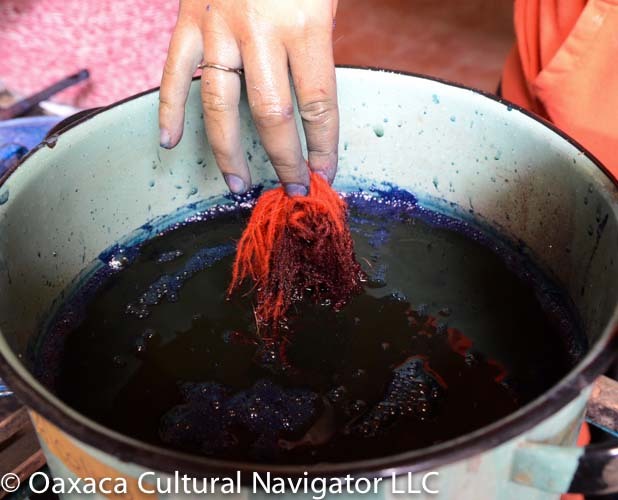 I have always wanted to explore Oaxaca and play with cochineal and local dyes. I wanted to inquire about your workshops. I would be interested in coming out for an adventure! Please let me know more information. I think my timeline is between March-May. But I can be flexible! Let me know how to move forward! Wonderful! Can you tell me a little more about how a custom trip like this would work? I am waiting to confirm some springtime classes I will be teaching and will have specific dates I can send you once that happens. March or April seems like the best time for me. I would love to come in the beginning of the months as I have some other plans to travel. How long would a dye course like this run for me and can you send me a tentative pricing breakdown? Very excited to plan this adventure! Hi. I’d like to get some information about your classes. I’d like to take the multi-day dyeing and weaving classes back to back in early June of 2017 as a retirement present to myself. Would this be possible?